Although Holi has ended, the season of sale doesn’t end as Asus has partnered with Flipkart for its Mobile Bonanza Sale. The sale has started on March 25 and will stay live till March 28. During this four-day sale, discounts and offers are being availed to the entire lineup of Asus Zenfone devices. Other offers on the purchase of the smartphones include a no cost EMI on Bajaj Finserv and credit and debit cards from all major banks. Flipkart’s Complete Mobile Protection Plan which covers theft is also being offered at a low price and there is also 5% instant discount on the EMIs with Axis Bank credit card. All variants of the Asus Zenfone 5Z, which is the flagship smartphone of the company are available on a discount of Rs 3,000 on Flipkart. During the Mobile Bonanza Sale, the 6GB RAM/64GB storage variant of the Asus Zenfone 5Z is available for Rs 21,999 while the 6GB RAM/128GB storage variant of the device is selling for Rs 24,999. The original prices of the devices are Rs 24,999 and Rs 27,999 respectively. Similarly, the most high-end variant of the Asus Zenfone 5Z with 8GB RAM/256GB storage is selling for Rs 28,999 instead of Rs 31,999. Along with discounts, the complete mobile protection plan of Flipkart is offered for Rs 399 instead of Rs 2,499. The Asus Zenfone Lite L1 is available on a discount of Rs 1,000. So, during the Mobile Bonanza Sale, the Zenfone Lite L1 is selling for Rs 4,999 and the complete mobile protection plan with it is being offered for Rs 9 instead of Rs 399. Similarly, the Asus Zenfone Max M1 is getting Rs 1,000 off of its original price of Rs 7,499. During the Mobile Bonanza Sale, the Zenfone Max M1 is selling for Rs 6,499 while the complete mobile protection plan is being offered for Rs 99 instead of Rs 399. The Asus Zenfone Max Pro M1 is getting Rs 500 off of its original prices on all the variants of the device. 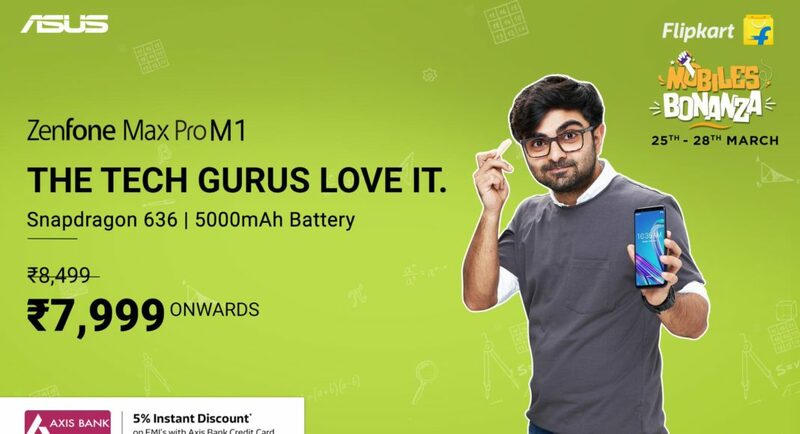 The 3GB RAM/32GB storage variant of the Zenfone Max Pro M1 is selling for Rs 7,999 while the 4GB RAM/64GB storage variant of the device sells for Rs 9,999 during the Mobile Bonanza Sale. The original prices of the devices are Rs 8,499 and Rs 10,499 respectively. The highest variant offers 6GB RAM/64GB storage and is selling for Rs 11,999 on Flipkart. It is worth noticing that the smartphone originally had a price tag of Rs 12,499. The complete mobile protection plan by Flipkart comes at Rs 99 instead of Rs 799 with the smartphone. The Asus Zenfone Max M2 with 3GB RAM/32GB storage is selling for Rs 7,999 during the Mobile Bonanza Sale which originally sold for Rs 8,499. Similarly, the 4GB RAM/64GB storage variant of the device sells for Rs 9,999 instead of Rs 10,499. The complete mobile protection plan is being offered for Rs 99 instead of Rs 799. Lastly, the Asus Zenfone Max M2 with 3GB RAM/32GB storage is selling for Rs 9,499 while the 4GB RAM/64GB variant has a price tag of Rs 11,499. The original prices of the devices were Rs 9,999 and Rs 11,999 respectively. The 6GB RAM/64GB storage variant of the Asus Zenfone Max Pro M2 is selling for Rs 13,499 instead of Rs 13,999. Along with that, the complete mobile protection plan is being offered for Rs 99 instead of Rs 1,299. Update: To read about discounts on other smartphones, click here.